The player is cast as Roger Samms, an entomologist planning to embezzle money from a research grant to escape his sordid life above an abandoned bar. An accident with his mother's enchanted locket unleashes the bad mojo, turning him into a cockroach. 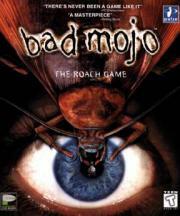 The storyline in Bad Mojo is loosely based on Franz Kafka's The Metamorphosis. (wikipedia.org).